In the following post I will demonstrate how to use the Qlikview FirstSortedValue chart function. This is a useful tool when trying to determine the min/max value for a specific field, based on a given dimension. 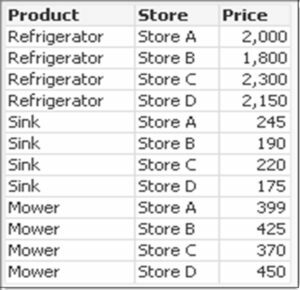 From Qlikview Help: FirstSortedValue() returns the value from the expression specified in value that corresponds to the result of sorting the sort_weight argument, taking into account rank, if specified. If more than one resulting value shares the same sort_weight for the specified rank, the function returns NULL. rank – This argument is optional. Default is 1 (top rank). By adding any value (n) as the rank, you get the nth ranked Output Field. In the 3rd and 4th examples above, I used the rank “2” to get the second highest and lowest Output Fields respectively. Here is the LOAD Script for the data used in the examples above. Give it a try yourself! Hello Bhars, are you using the sample data provided in the post? Could you provide the sample that is causing the issue? Hello Devarasu, looks like the link with your same question on Qlik Community provided a couple alternatives for your NULL issue. The Qlik Community is a great place to find just about any answer. Thanks for sharing on my site. Sorry I didn’t get back to you in time, but it looks like you are all set. Just reply if you have any other questions.